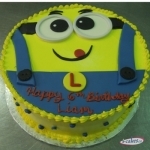 Order your Birthday Cake Today! Our Bakery offers decorated cakes, which are not only delicious, but beautifully decorated as well! Regular cake flavors. We have got a lot of simple birthday cake recipes and some ideas for you really to make at home.